Each Position Controller uses a quadrature encoder system to reliably track the position and speed of a wheel at all times. With the included plastic encoder disk, the Position Controller has a resolution of 36 positions per rotation; this equates to approximately 0.5 inches of linear travel per position using 6-inch tires (not included). The Position Controller calculates and reports position and average speed data on command. This leaves the main processor free to handle more important tasks like reading GPS coordinates, processing sensor information, and maneuvering complex environments. The Position Controller is compatible with any microcontroller via a single-wire half-duplex asynchronous serial communication (UART) bus. 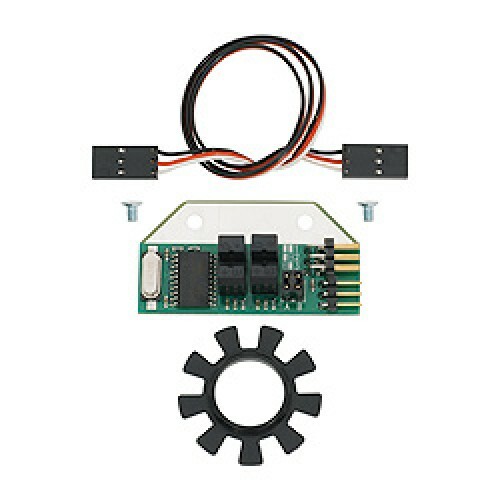 Up to four Position Controller devices can be controlled on the same bus to minimize I/O requirements. For increased functionality, multiple Position Controllers can be interfaced with our motor controller (sold separately) to control the position of the wheel and automatically provide smooth speed ramping as well as accurate position advancement capability.